This Ocean Front Suite is located between Key Largo and Islamorada. Ideally located on the second floor (stairs and elevator access) right across from the newly renovated resort size heated pool. The suite has an ample breakfast bar and comfortably sleeps 2 adults (Queen Bed) and 2 children (Pull out Sofa). It has a fully equipped kitchen, granite counters, washer and dryer and flat screen TV's in the living room and bedroom. Immaculately clean and beautifully decorated. The Property is located on a 65 acre privately owned resort. Amenities offered includes lighted tennis courts, a kids playground, a private beach with tiki huts and outdoor grills, a marina (a straight shot to the Atlantic ocean) with a boat ramp and newly renovated piers and slips, a resort size heated pool, hot tub and a bar serving your favorite cocktails and a clubhouse/cafe. Other onsite activities include nature trails, kayak rentals, children playground and a sunrise/sunset gazing Tiki Hut that goes out into the Atlantic water. Reservations in advance with the Ocean Pointe Marina manager is required for parking/dockage for your boat. Maximum boat size allowed in the Marina is 28' in length. Boat ramp is also located on property. Boat insurance and registration MUST be in the name of the guest registered at the resort. Fees apply for wet slips and trailer parking which may vary according to the season. Tavernier is located just South of Key Largo known as "THE DIVING CAPITAL OF THE WORLD" due to it's proximity to multiple breathtaking reefs and wrecks, that invite to exploring, diving and snorkeling. Nearby Pennekamp State Park offers more water activities and an opportunity to discover the "Christ Of The Abyss" statue. A short distance away you can enjoy the Theater Of The Sea or take a casino sunset cruise, go charter fishing off shore or backcountry, swim with dolphins, sea rays or sharks, visit the Florida Keys wild bird rehabilitation center, the Diving Museum or simply drive south to mile marker "0" KEY WEST located 90 miles away for a fun day trip. Getting there is half the fun and the scenery is like no other in the world. I am from Marathon and moved away 8 years ago. I had no idea that Ocean Point exhisted!! So glad we found a new spot! Wonderful condo and awesome owners to deal with. We will be back!! Thanks so much Shadow! Hope to have you all back very soon. First time at Ocean Pointe--great base for seeing the Keys. This is a great well appointed condo, Stephen could not have been easier to deal with. Entire unit looked to have been redone right before we arrived, very quiet and pool was great. Wonderful food and drinking spots all around. Highly recommend this unit--been using VRBO for over ten years, this is one of our best! Fantastic place in a wonderful location! We absolutely loved our stay at Ocean Point Suites! The view is incredible!! 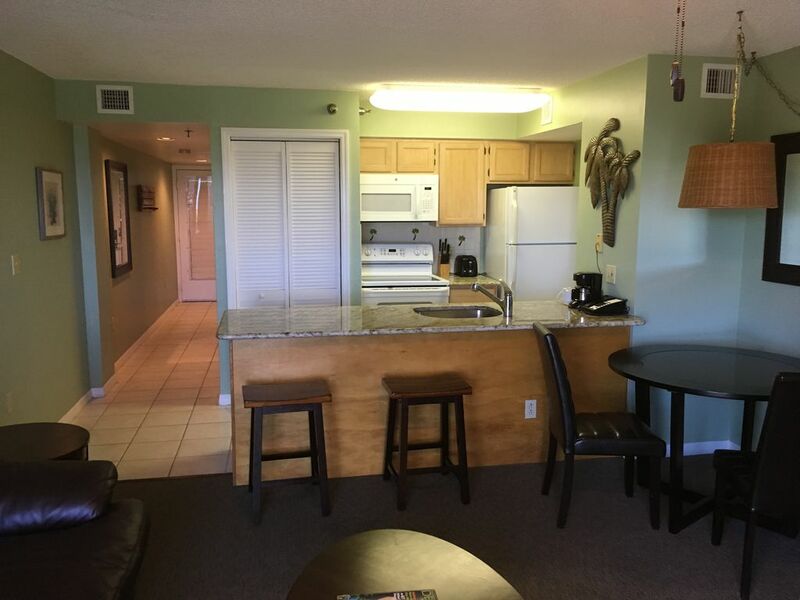 The condo was a perfect size for me and my husband and it was located in a great spot for the activities we planned on our vacation (fishing, kayaking, etc.). It was very easy to find, parking was a breeze, the area was quiet, well maintained, and felt very safe. When we arrived we immediately felt relaxed and comfortable. Stephen and Delfina were wonderful hosts. Their place was beautifully maintained and their hospitality was exceptional. They offered us helpful suggestions and were very responsive to our questions. We would highly recommend staying in this condo and would definitely stay again and again. We enjoyed our stay at Ocean Pionte. The condo was better than the pictures for sure. Very clean, great water views and across from a large heated pool. Everyone at Ocean Pionte was so friendly. We had a wonderful vacation but the best part was our dealings with Stephen. He was so helpful and returned our deposit soon after we checked out. We are looking forward to returning to this unit in Ocean Pionte. Thank you Stephen for making our stay awesome. Hi Matt & Mary, It is such a great joy to have made your vacation a very special one. I hope to see you both in the near future! We were so happy with our stay. Our hosts were absolutely great to work with. The property was clean, roomy and just perfect for us. The pool and hot tub was beautiful. We hope to stay again, in fact we did not want to leave. A boat ramp, boat trailer parking and boat dockage for boats up to 28' are available thru The Marina Managers Office for a FEE. Certificate of Insurance and Registration are required. Rates listed are for 2 individuals during the stay.